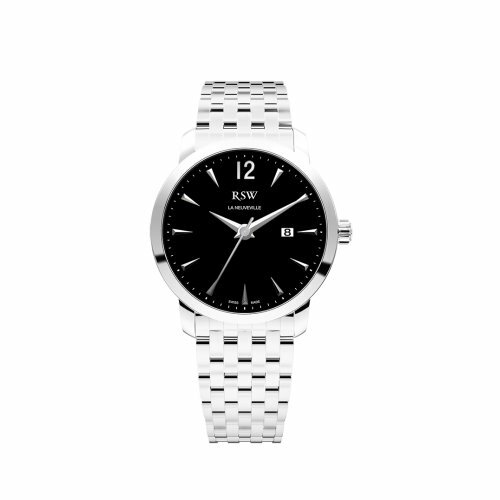 This stainless steel classy watch from RSW’s La Neuveville Lady Collection is designed to render pure luxury with style. Specification: 1- 32mm, Stainless steel circular case with silver bezel and crown. 2- Circular silver dial with lustrous blue hands of varying sizes for hours, minutes and seconds. Dial is made up of anti-reflective sapphire. 3- Stainless steel bracelet with deployment clasp. 4- Analog display, roman numerals marking at every hour. 5- Swiss made and water resistant up to 3 ATM or 30 meters.